Columbia St. Mary’s Hospital is a new facility that sits on a bluff overlooking Lake Michigan. At 10 stories high it is visible from downtown Milwaukee and along the shores of Lake Michigan. This is APW’s largest Dri Design job covering 130,000 sf with 13,000 panels. APW was originally awarded this project which, at the time, included ACM on 38,000 sf of wall area. 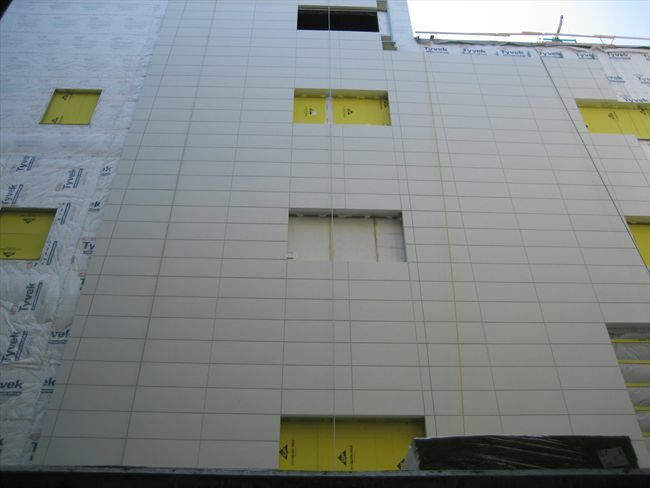 Due to the ability of Dri Design to provide a state of the art pressure equalized rainscreen panel system with less pieces and parts to factory and field assemble, the product was changed to Dri Design. A further change was made replacing 92,000 sf of precast with Dri Design due to the panel’s rainscreen design and economies of installation. APW also furnished and installed all furring and insulation outboard of the weatherbarrier.